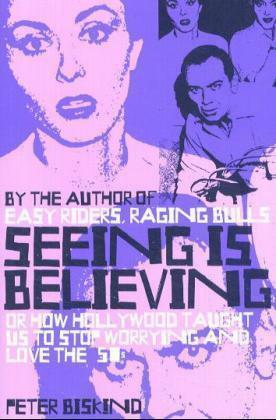 Seeing is Believing is a provocative, shrewd and witty look at the Hollywood fifties movies we all love - or love to hate - and the thousand subtle ways they reflect the political tensions of the decade. Peter Biskind concentrates on the films everybody saw but nobody really looked at, classics such as Giant, Rebel Without a Cause, and Invasion of the Body Snatchers, and shows us how movies that appear politically innocent in fact bear an ideological burden. As we see organization men and rugged individualists, housewives, and career women, cops and docs, teen angels and teenage werewolves fight it out across the screen, from suburbia to the farthest reaches of the cosmos, we understand that we have been watching one long dispute about how to be a man, a woman, an American - the conflicts of the time in action. "Nothing escapes Peter Biskind and he is very funny. His book is indispensable reading for anyone interested in American cinema or recent American history." --Michael Wood, author of "America in the Movies"
"A brilliant and imaginative analysis of the political and sexual crosscurrents of the fifties in the movies." --Barbara Ehrenreich, author of "Blood Rites"
Peter Biskind, former executive editor of Premiere, is the author of The Godfather Companion and Easy Riders, Raging Bulls. A contributing editor at Vanity Fair, he has written for amongst others The New York Times, The Washington Post and Rolling Stone.